By 1961 sadly Bryan was dead from an odd dirt track accident and there was a young group of hard chargers, including Bobby Marshman who made his mark by finishing seventh in the 1961 Indy 500, winning top rookie honors along with Parnelli Jones.Good news for Indy Car fans, Replicarz has created Bryan’s 1958 Indy winner and Marshman’s flamboyant orange and chrome 1961 Indy racer in 1:18 scale. 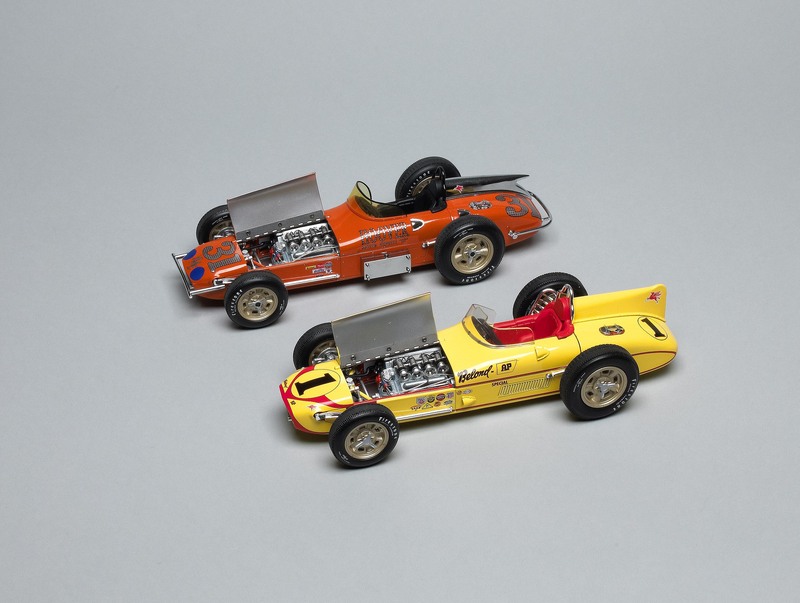 These are both laydown roadsters, originally designed by George Salih, with his car winning the 1957 and ’58 Indy races.Previously noted diecast model maker Carousel 1 had created an excellent version of Sam Hanks’ 1957 Indy winner, and these two racers are created off the same mold, which Replicarz purchased from Carousel 1 after it ceased production. But these are not simply new paint jobs and decals, upgrades have been made. The Bryan car, which is identical to the 1957 Indy winner in most respects now features a chrome roll bar and chrome elbow protection cage that keeps the driver’s elbow from touching the right rear tire. Both were improvements made by designer and chief mechanic Salih for the 1958 race. Likewise Replicarz has toned down the interior shine that characterized the earlier Carousel 1 model. The red driver’s seat features a matte finish that looks more realistic. The Bryan car remains in the Belond Special yellow paint scheme, with some chrome suspension pieces and gas cap, plus matte gold wheels with silver wheel nuts. There’s a slightly larger windshield that’s unique to the Bryan car vs. the Hanks machine, plus all the appropriate sponsor decals, including Mobil Oil’s Pegasus on the car’s fin. Naturally Bryan’s name and Salih’s are painted on the car’s side. Marshman’s Hoover Motor Express racer is a gorgeous orange with chrome tailfin and small Pegasus decal close to its black roll bar. The interior is flat black and there’s one more air scoop (chromed) on its side than on the Bryan car. Both cars feature the same wheels and branded Firestone tires, but the Marshman car includes a chrome push bar on the tail and a smaller one in front. There’s a giant chrome oil tank on the left side that adds to the car’s unique look. Both racers feature the same interior lap belt and gauges, which are well executed, and the same Offy engine under the split louvered hood. Historically, why are these two models important to Indy fans? Well, the Phoenix-born Bryan was THE star for most of the 1950s, a cowboy-type chomping on his trademark cigar after every race and lifting both hands off the wheel whenever he crossed the finish line as the winner. He won the 1953, ’54 and ’56 USAC Indy Car championships, and was second in 1955. But unlike that era’s other most popular driver, Tony Bettenhausen, Bryan won Indy. This model is his revolutionary laydown roadster with the engine on its side and the transmission shifted to the car’s left side. Salih came up with the idea as a way to lower the car’s profile, shift weight to the left side and make the racer faster through Indy’s four turns. Other car builders soon followed suit. Marshman was a handsome and gifted young driver who made his Indy debut in 1961 and was impressive. He was a front-row starter in 1962 and ’64 and led the ’64 race early before bottoming his car in a turn, creating an oil and water leak that put him out of the race. Sadly, his career was cut short in a fatal tire-testing accident later that year. Many think Marshman would have gone on to be among the best Indy racers. I tend to agree. Vintage Indy enthusiasts should welcome back the laydown roadsters, especially at the reasonable $149.99 price. Plus Replicarz is not making a huge number, just 1,000 of the Bryan car and only 750 of the Marshman racer. That should ensure they retain their value for buyers too. But wait, there’s more: For those who prefer to think of the 1970s and ’80s as Indy’s glory years, Replicarz plans to bring along some 1984 Marches, 1972 and ’75 McLarens, ’73 Eagles and A.J. Foyt’s 1977 Coyote in the near future. There’s even talk of some 1:43 Indy racers too, and soon we should be seeing a detailed 1:18 Marmon Wasp, the first Indy winner. Plus, in case you missed it, Replicarz brought out a Mario Andretti 1969 Indy winner earlier this year. Good times have returned for Indy Car collectors!